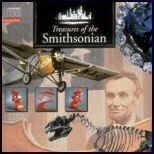 Project: "Treasures of the Smithsonian"
"Treasures of the Smithsonian" presents a sampling of 150 objects from the Smithsonian's 14 museums in high-quality audio-visual presentations, with narration, sound effects, and music. Viewers can select treasures by museum, by date, by thematic tour, or by category. Each treasure include a text Note, giving details about who, what, when, where, materials, dimensions, photo credits, and additional commentary. 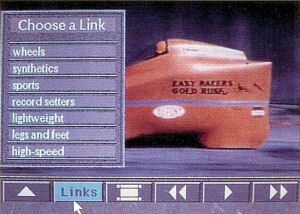 Each treasure also has "links," allowing viewers to jump from one related treasure to another without using the menu. Some treasures have "toys" — special interaction allowing viewers to, say, walk around a sculpture, view a detail of a painting, or hear sounds associated with an instrument or device. 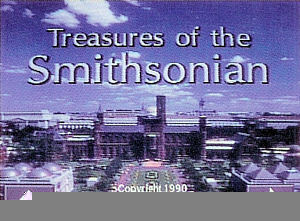 The main menu is a large architectural space strewn with a few enigmatic objects, evoking the combination of grandeur and mustiness associated with "the nation’s attic," as the Smithsonian is often called. When clicked, the objects on view lead to various pathways for exploring the content -- a map for choosing by museum, a tree-stump for choosing by date, a file cabinet (by category), a bust (by person), and posters for tours. 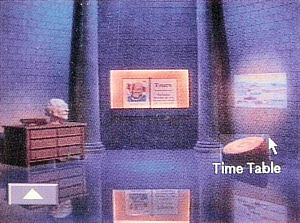 The visual theme of masonry surfaces reappeared in control panels and menus throughout the program. Every treasure has its own mini-movie, with a sequence of images, music or sound effects, and a commentary by Ted Parks, a popular frequent contributor to Smithsonian Magazine. Ranging from fossils and teepees to airplanes, quilts, presidential portraits, contempoary art, and a cheetah at the zoo, the presentations offer a wide variety in music, mood, and content. For some treasures, a "More" button lets the viewers "play" with the object in some way. For example, you can "walk around" a sculpture by moving a slider bar from left to right. For paintings, you can zoom in on a close-up. For a Telegraph Key, click on a letter to hear it in Morse Code. For a cello and an Appalachian Dulcimer, you can hear music played on that instrument.